“V” is short for Very High Speed Integrated Circuits. Designed for and sponsored by US Department of Defense. Designed by committee ( ). 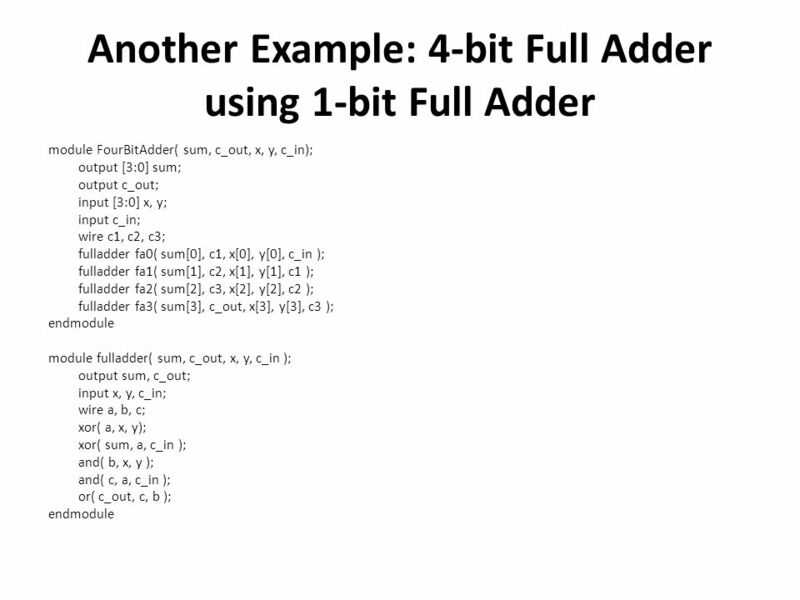 Syntax based on Ada programming language. Was made an IEEE Standard in 1987. 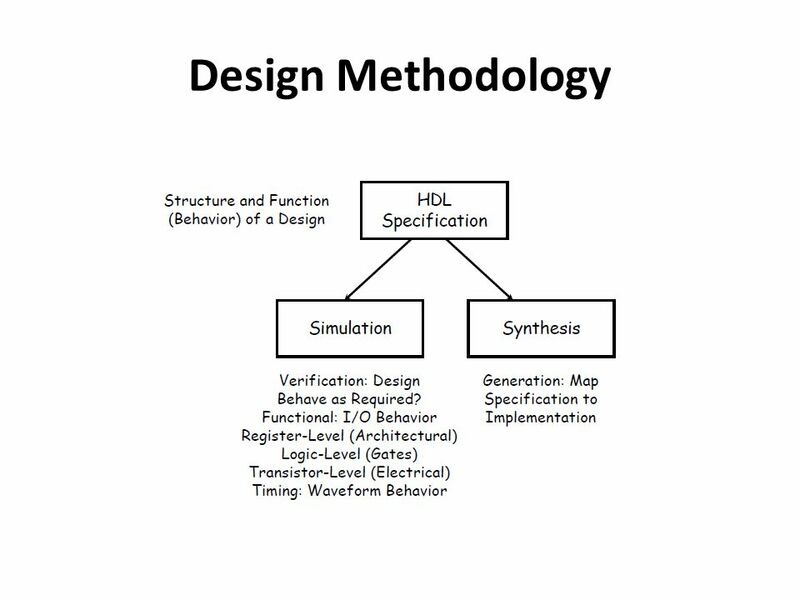 Verilog HDL (VHDL) Was introduced in 1985 by Gateway Design System Corporation, now a part of Cadence Design Systems, Inc.'s Systems Division. 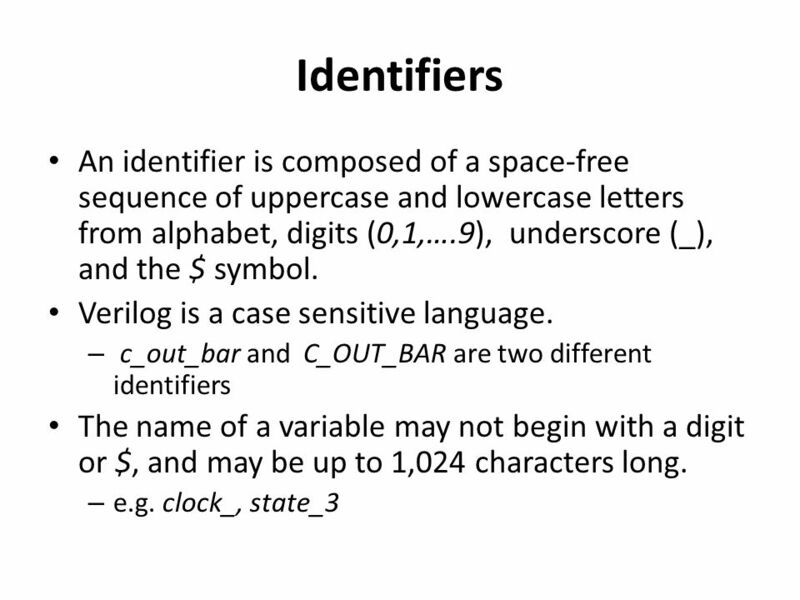 Was made an IEEE Standard in 1995 Syntax based on C programming language. 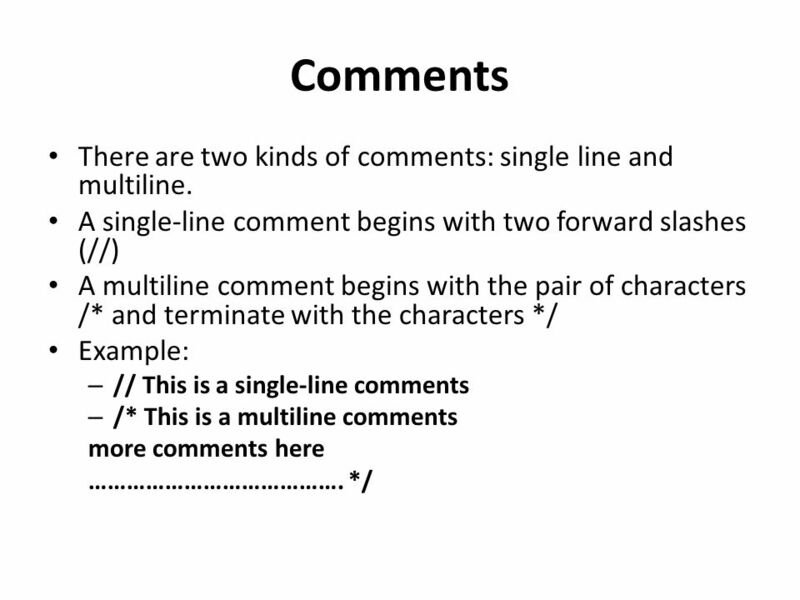 6 Comments There are two kinds of comments: single line and multiline. 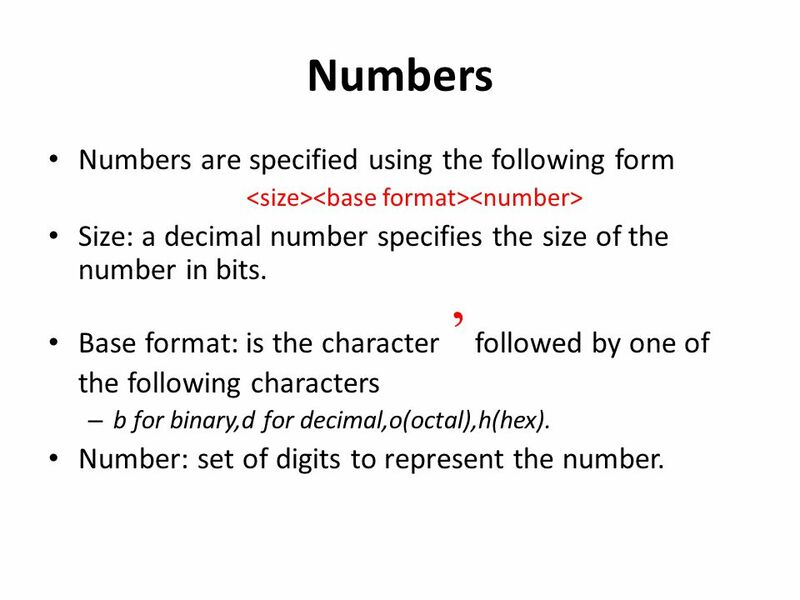 Numbers Numbers are specified using the following form <size><base format><number> Size: a decimal number specifies the size of the number in bits. Base format: is the character ’ followed by one of the following characters b for binary,d for decimal,o(octal),h(hex). 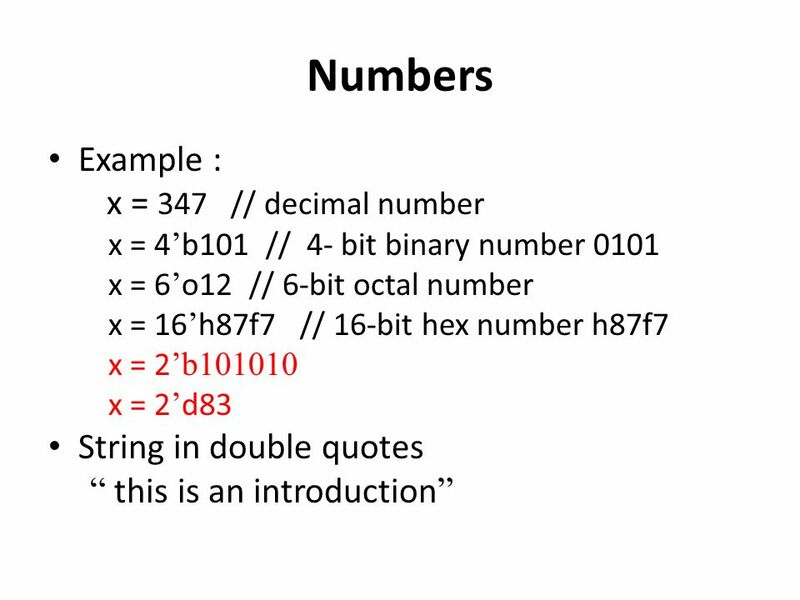 Number: set of digits to represent the number. 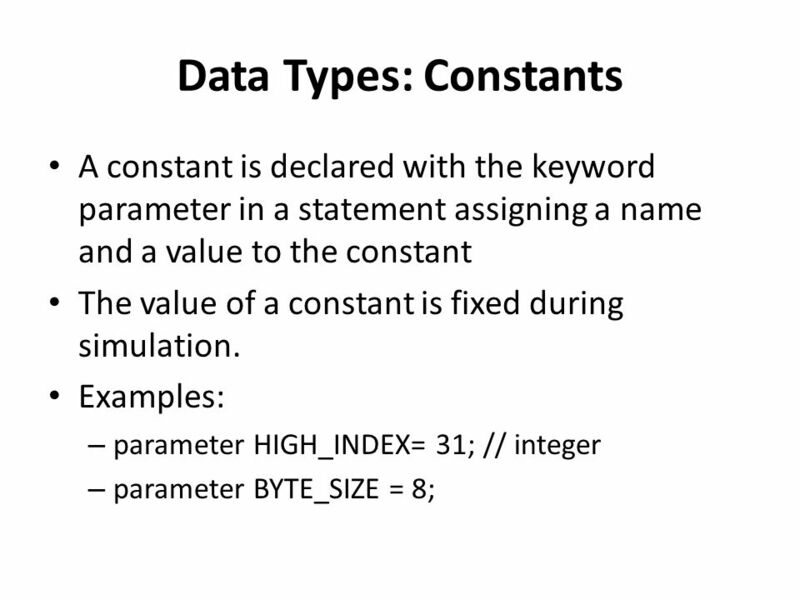 13 Data Types: Variables Two basic families of data types for variables: Nets and Registers Net variables – e.g. wire Variable used simply to connect components together Usually corresponds to a wire in the circuit. 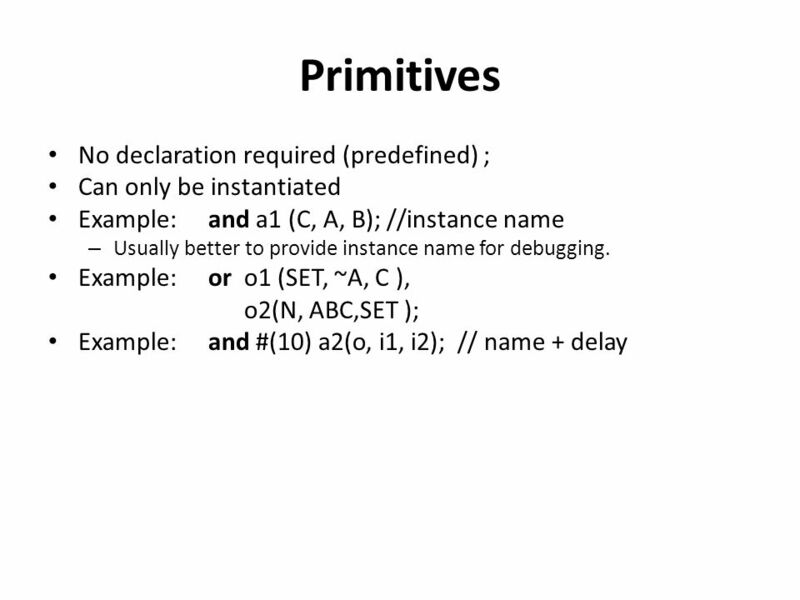 Register variables – e.g. 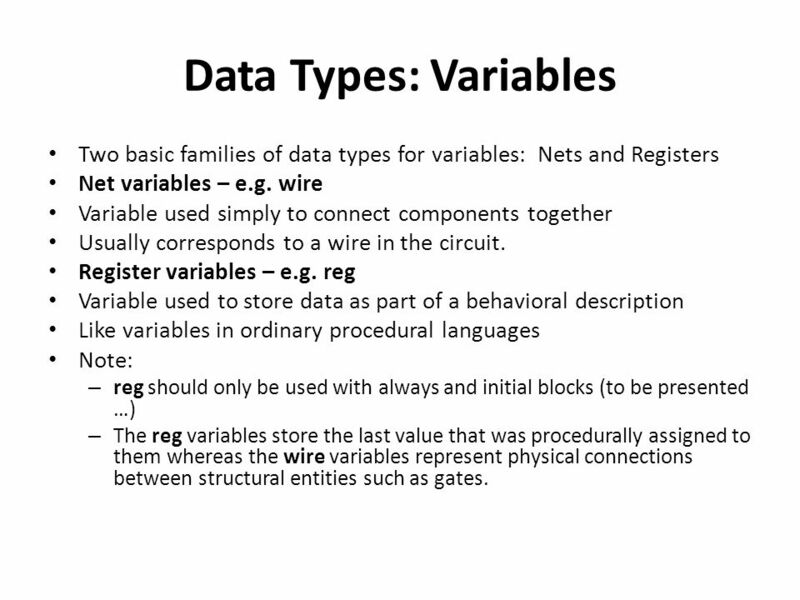 reg Variable used to store data as part of a behavioral description Like variables in ordinary procedural languages Note: reg should only be used with always and initial blocks (to be presented …) The reg variables store the last value that was procedurally assigned to them whereas the wire variables represent physical connections between structural entities such as gates. 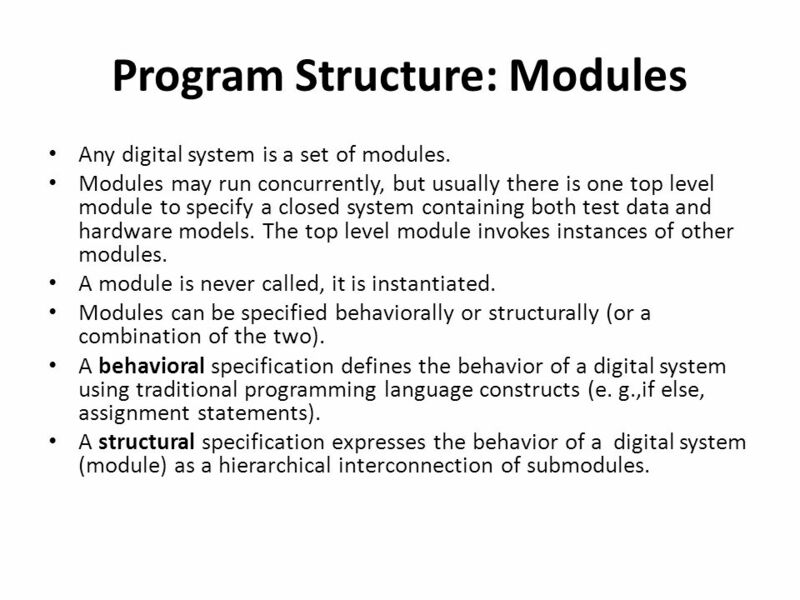 Any digital system is a set of modules. 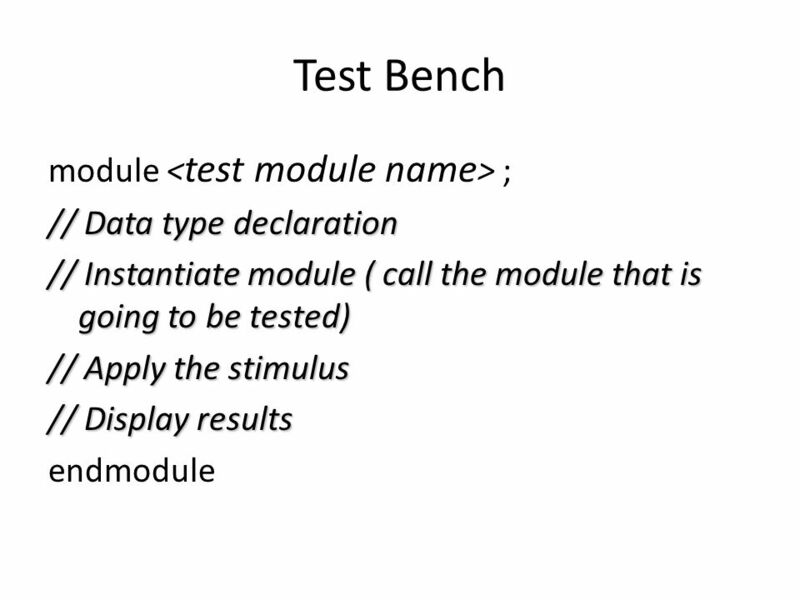 Modules may run concurrently, but usually there is one top level module to specify a closed system containing both test data and hardware models. The top level module invokes instances of other modules. A module is never called, it is instantiated. Modules can be specified behaviorally or structurally (or a combination of the two). 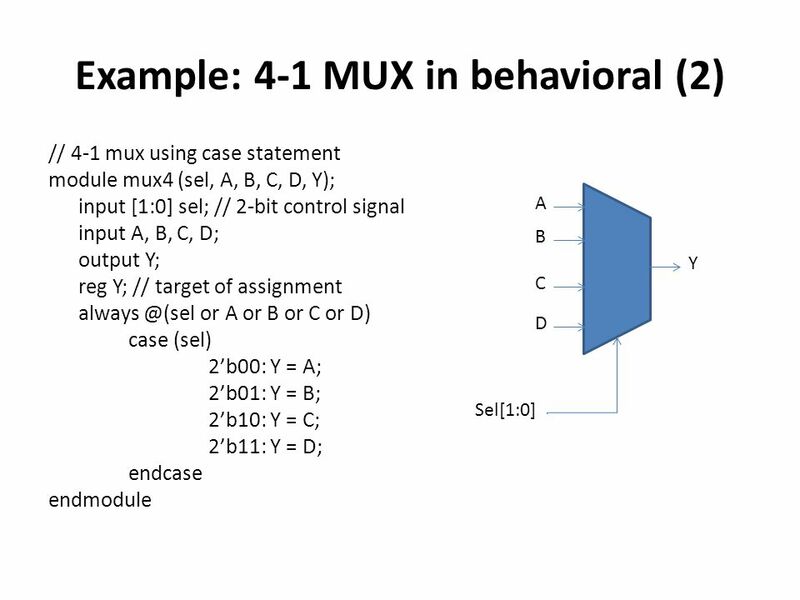 A behavioral specification defines the behavior of a digital system using traditional programming language constructs (e. g.,if else, assignment statements). 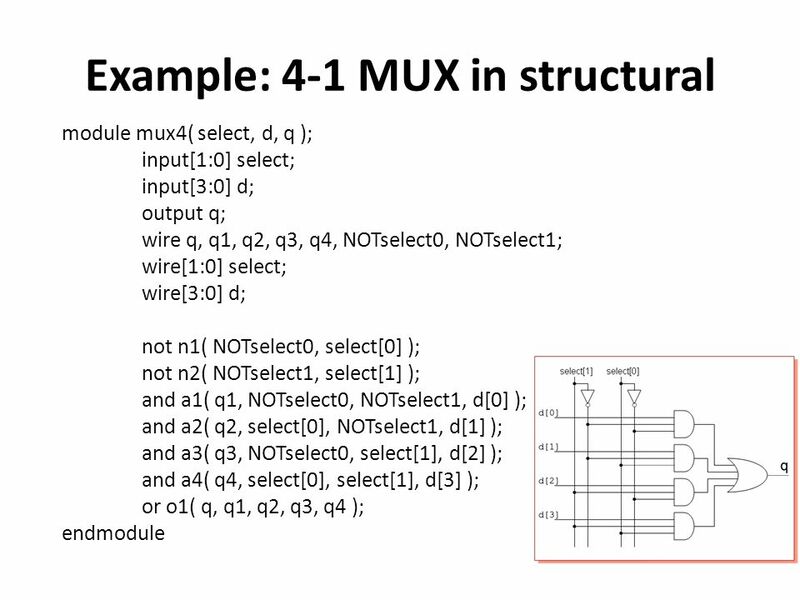 A structural specification expresses the behavior of a digital system (module) as a hierarchical interconnection of submodules. 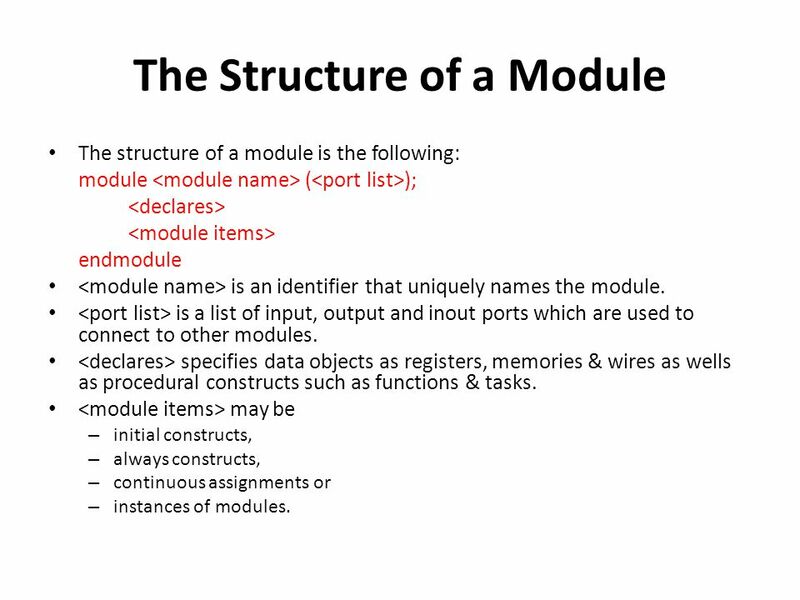 The structure of a module is the following: module <module name> (<port list>); <declares> <module items> endmodule <module name> is an identifier that uniquely names the module. <port list> is a list of input, output and inout ports which are used to connect to other modules. <declares> specifies data objects as registers, memories & wires as wells as procedural constructs such as functions & tasks. <module items> may be initial constructs, always constructs, continuous assignments or instances of modules. 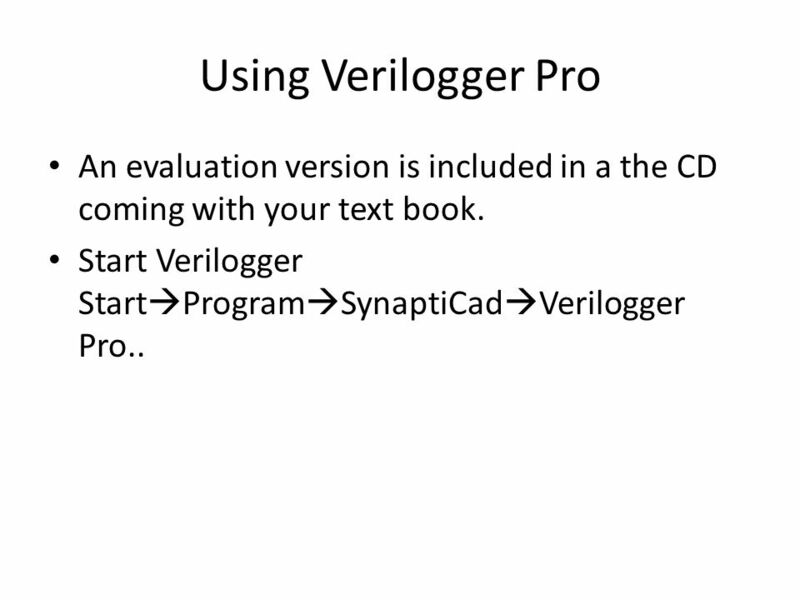 21 Using Verilogger Pro An evaluation version is included in a the CD coming with your text book. 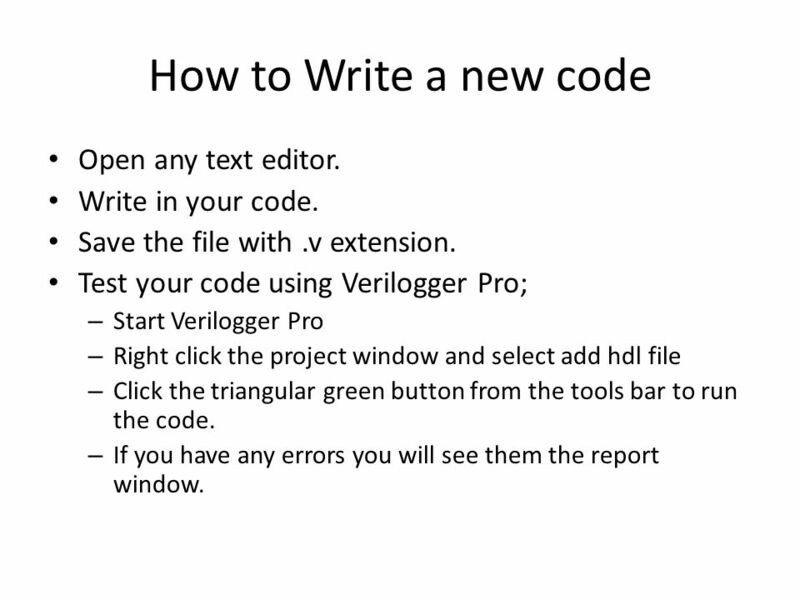 Start Verilogger StartProgramSynaptiCadVerilogger Pro..
22 How to Write a new code Open any text editor. Write in your code. Save the file with .v extension. Test your code using Verilogger Pro; Start Verilogger Pro Right click the project window and select add hdl file Click the triangular green button from the tools bar to run the code. If you have any errors you will see them the report window. 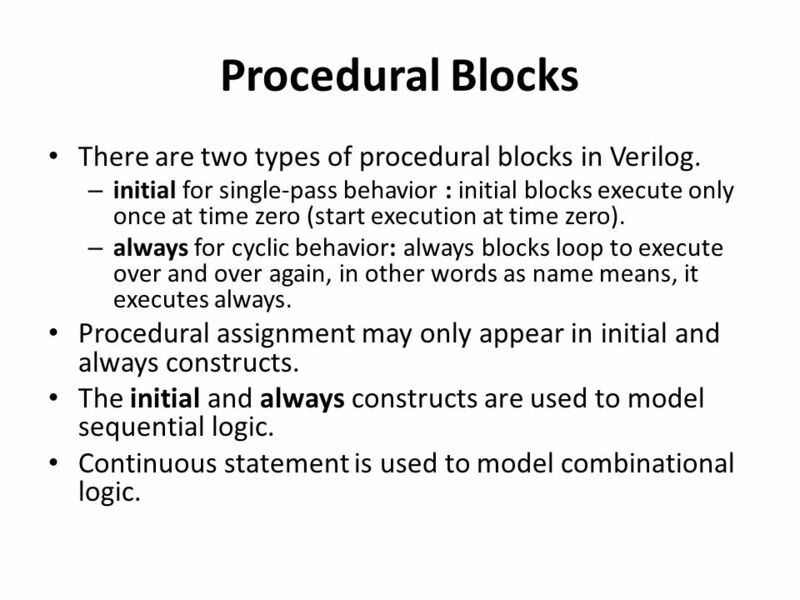 26 Procedural Blocks There are two types of procedural blocks in Verilog. 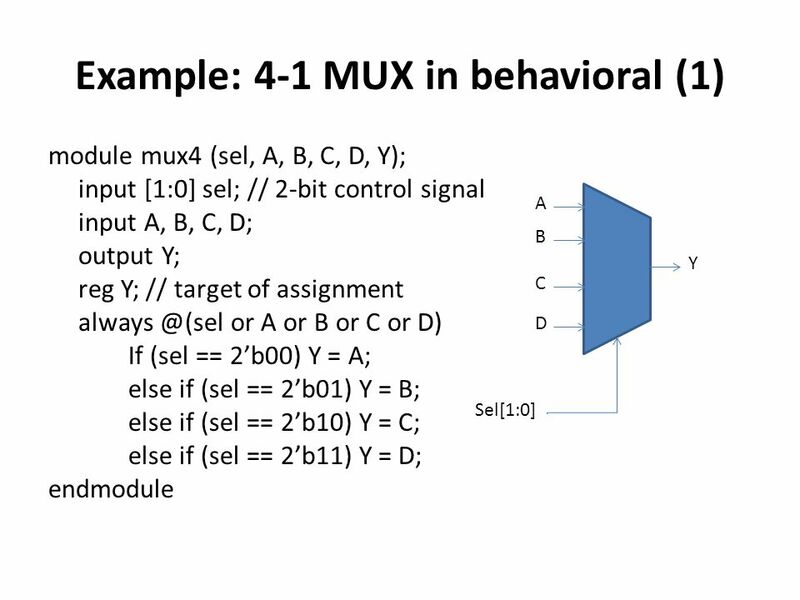 initial for single-pass behavior : initial blocks execute only once at time zero (start execution at time zero). 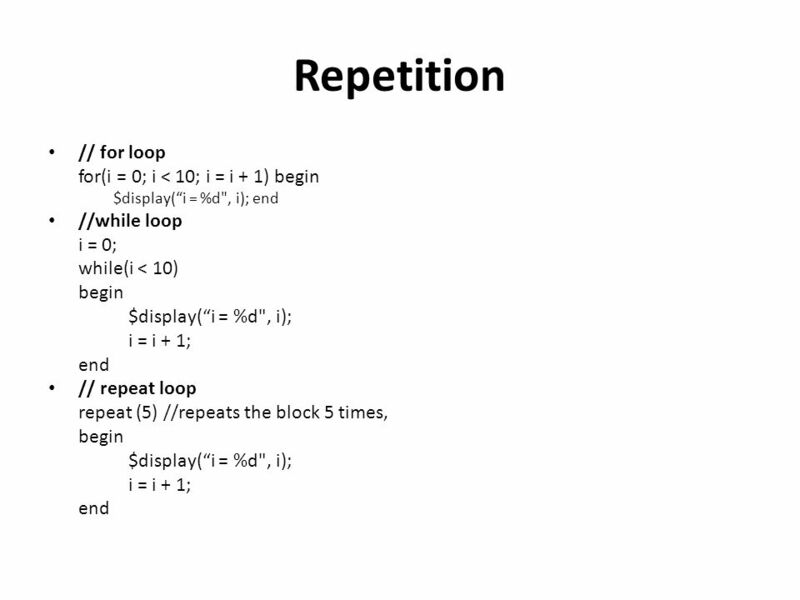 always for cyclic behavior: always blocks loop to execute over and over again, in other words as name means, it executes always. 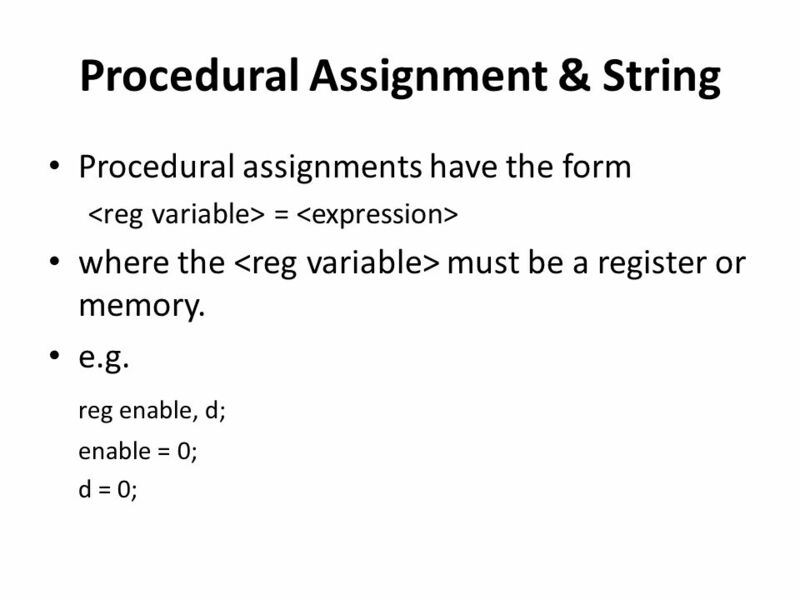 Procedural assignment may only appear in initial and always constructs. 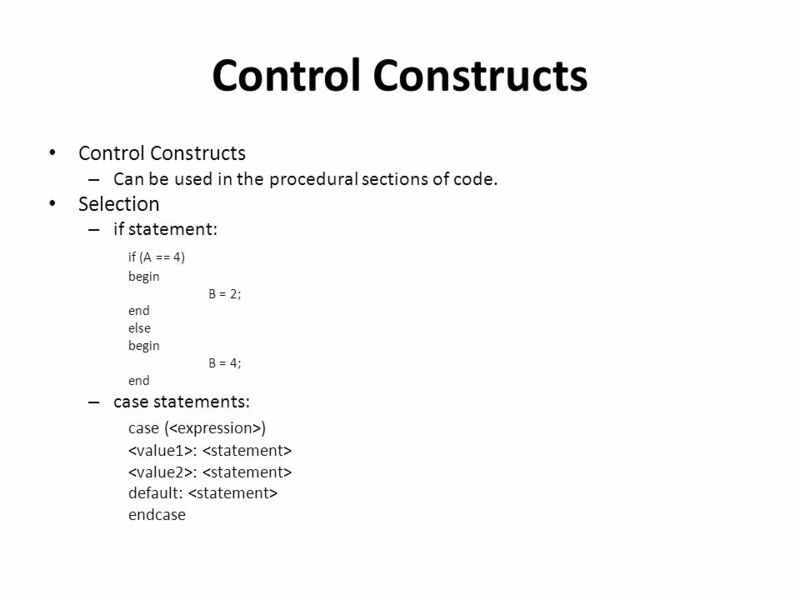 The initial and always constructs are used to model sequential logic. 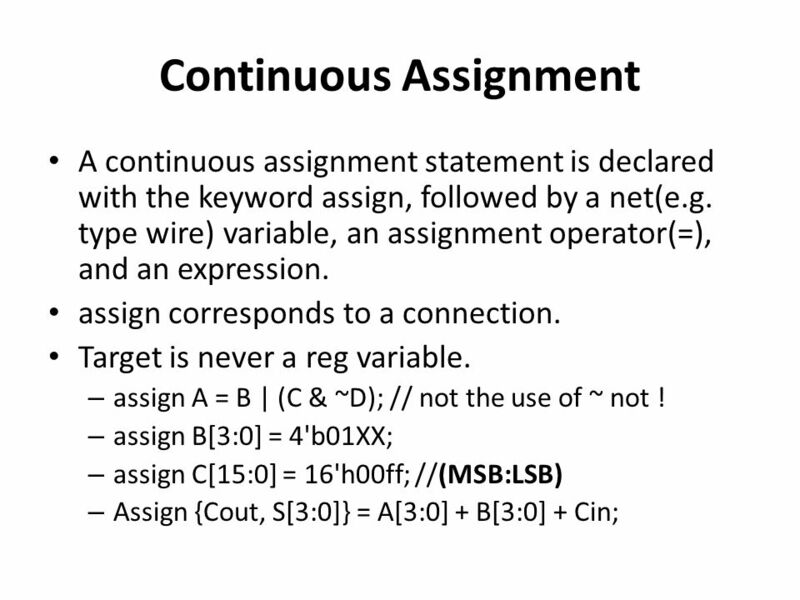 Continuous statement is used to model combinational logic. module initial_example(); reg clk,reset,enable,data; initial begin clk = 0; reset = 0; enable = 0; data = 0; end endmodule The initial block is executed at time 0. 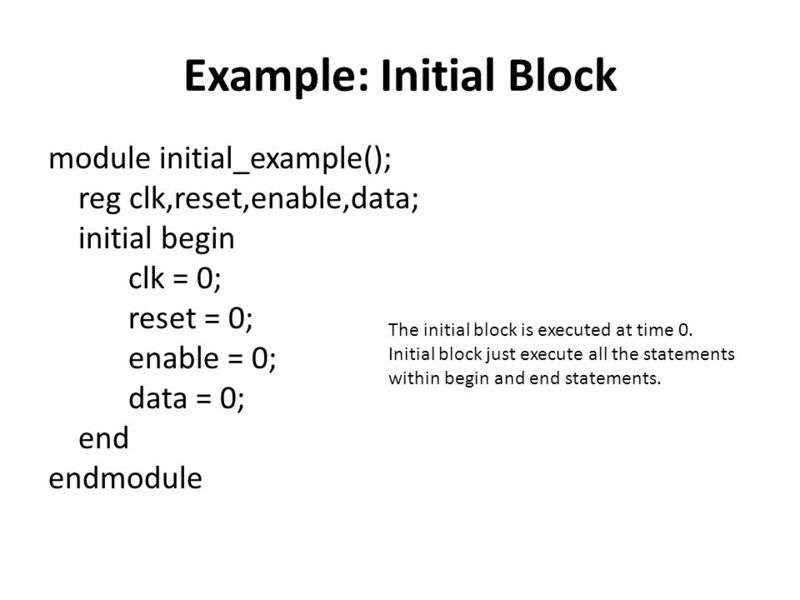 Initial block just execute all the statements within begin and end statements. 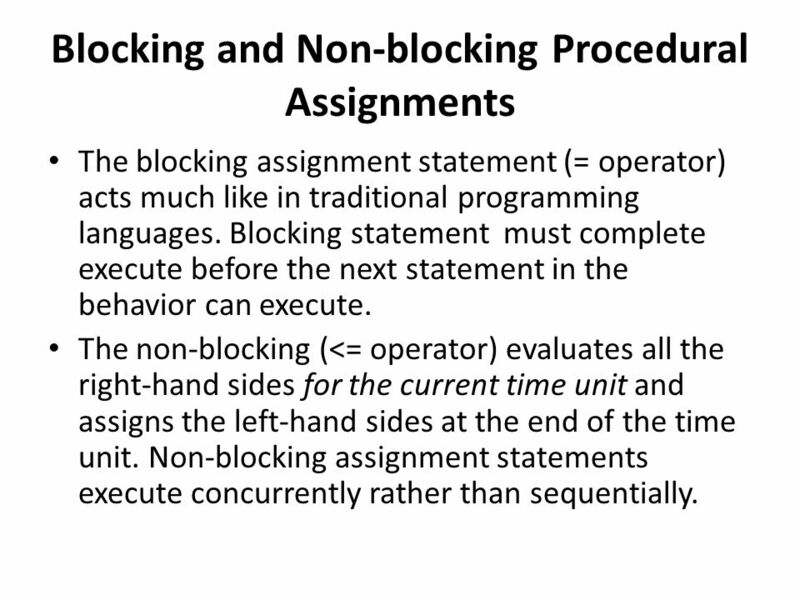 The blocking assignment statement (= operator) acts much like in traditional programming languages. Blocking statement must complete execute before the next statement in the behavior can execute. The non-blocking (<= operator) evaluates all the right-hand sides for the current time unit and assigns the left-hand sides at the end of the time unit. Non-blocking assignment statements execute concurrently rather than sequentially. 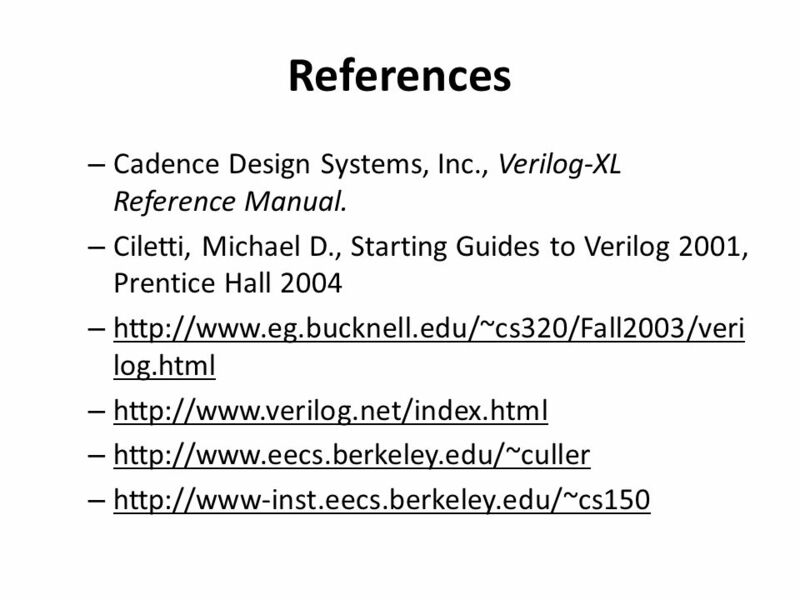 36 References Cadence Design Systems, Inc., Verilog-XL Reference Manual. 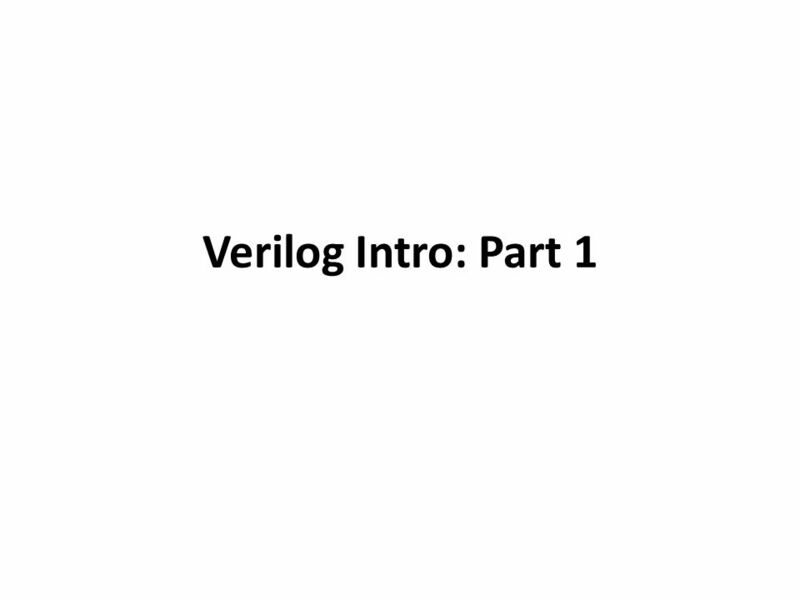 Download ppt "Verilog Intro: Part 1." 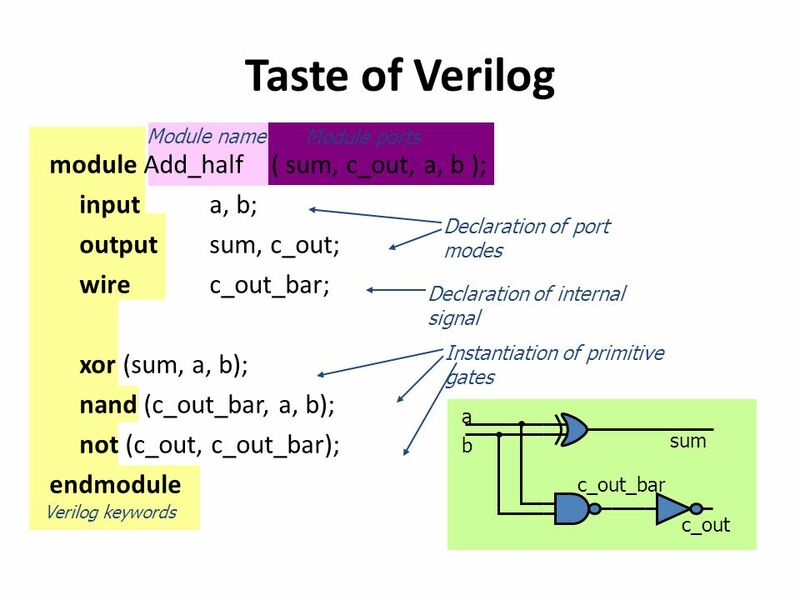 Verilog Overview. University of Jordan Computer Engineering Department CPE 439: Computer Design Lab. 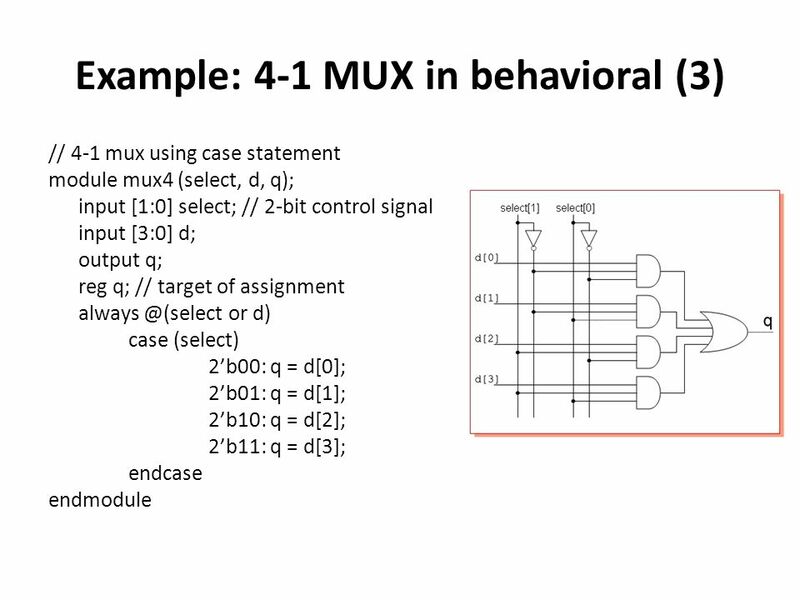 ELEN 468 Lecture 21 ELEN 468 Advanced Logic Design Lecture 2 Hardware Modeling. Chapter 11 Verilog HDL Application-Specific Integrated Circuits Michael John Sebastian Smith Addison Wesley, 1997. Combinational Logic with Verilog Materials taken from: Digital Design and Computer Architecture by David and Sarah Harris & The Essentials of Computer. 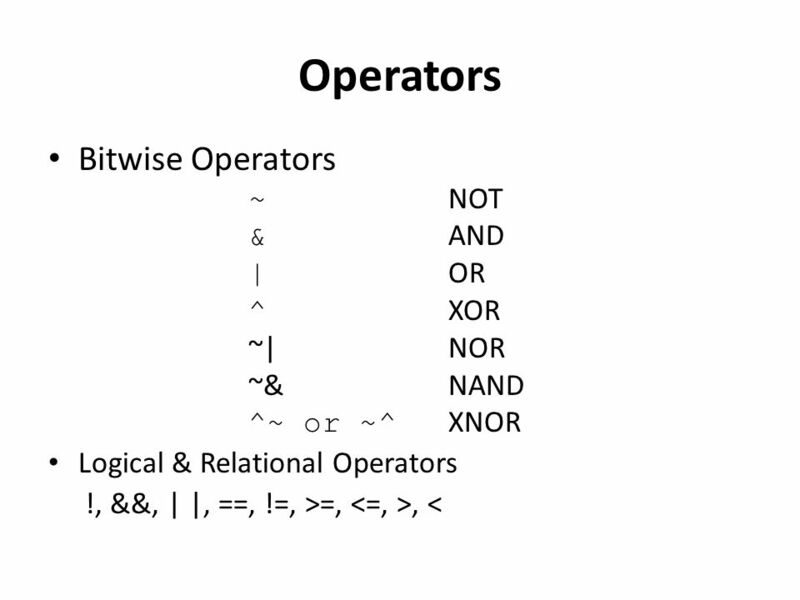 16/04/20151 Hardware Descriptive Languages these notes are taken from Mano’s book It can represent: Truth Table Boolean Expression Diagrams of gates and. SYEN 3330 Digital SystemsJung H. Kim Chapter SYEN 3330 Digital Systems Chapters 4 – Part3: Verilog – Part 1. 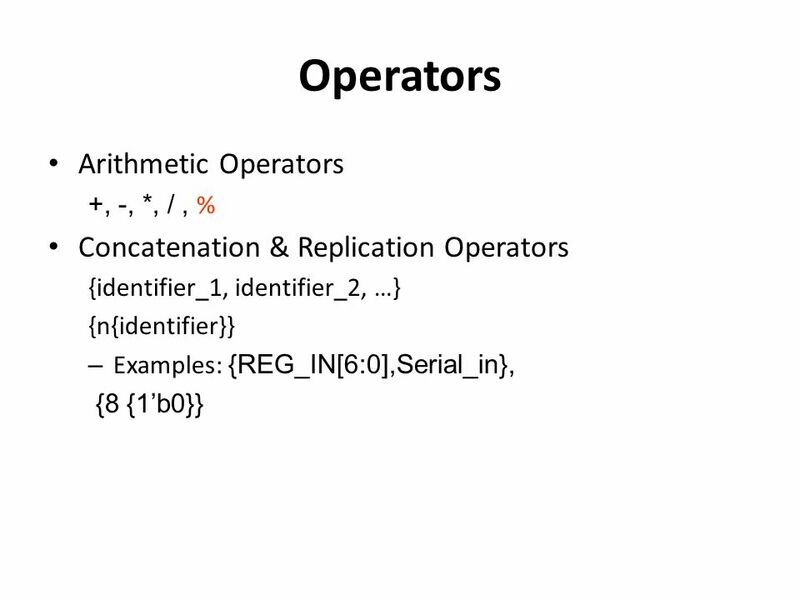 1 Brief Introduction to Verilog Weiping Shi. 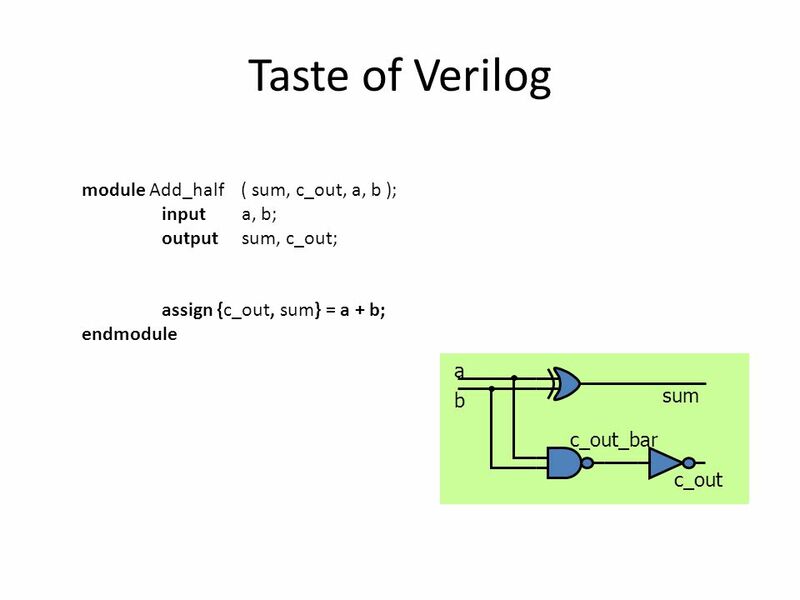 2 What is Verilog? It is a hardware description language Originally designed to model and verify a design.  HDLs – Verilog and Very High Speed Integrated Circuit (VHSIC) HDL   Widely used in logic design   Describe hardware   Document logic functions. 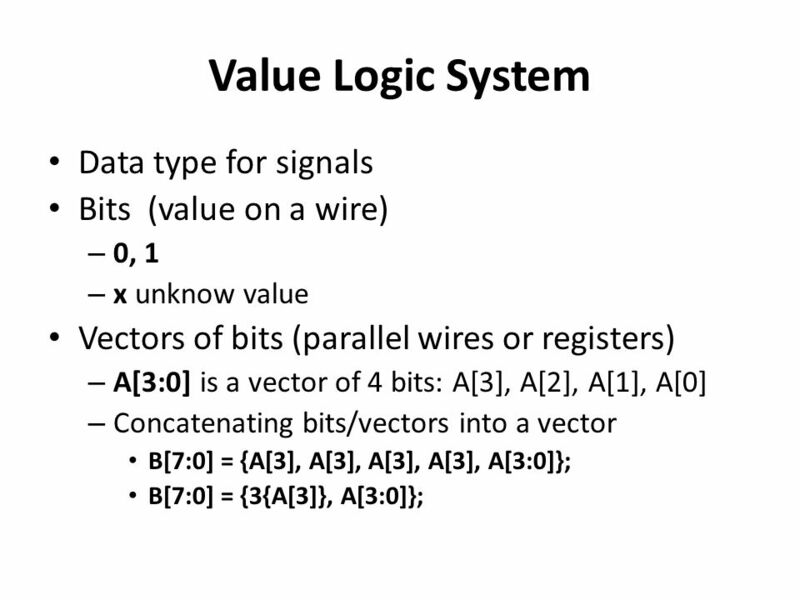 1 Lecture 1: Verilog HDL Introduction. 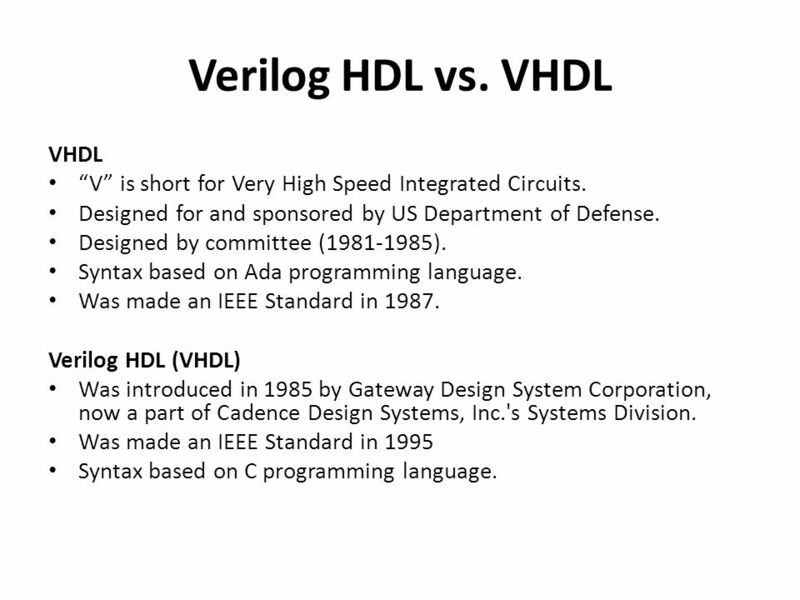 2 What is Verilog HDL? 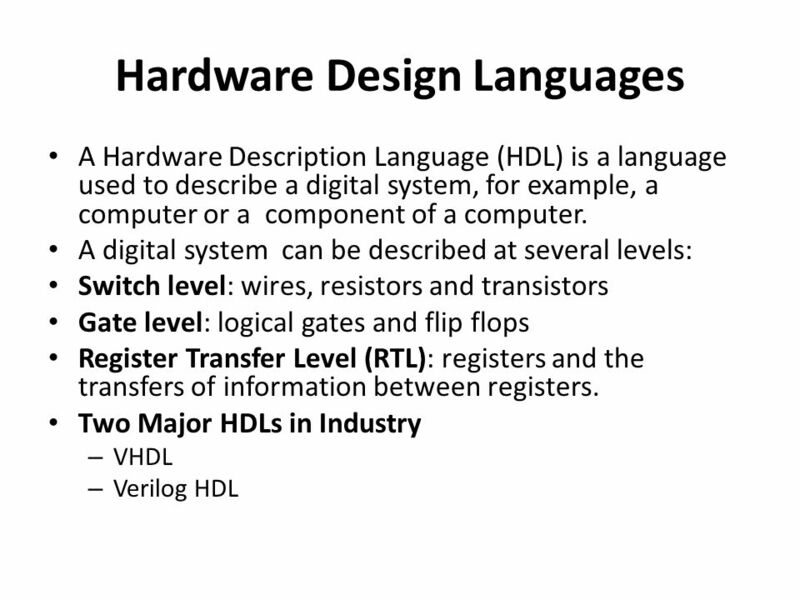 Verilog Hardware Description Language(HDL)? 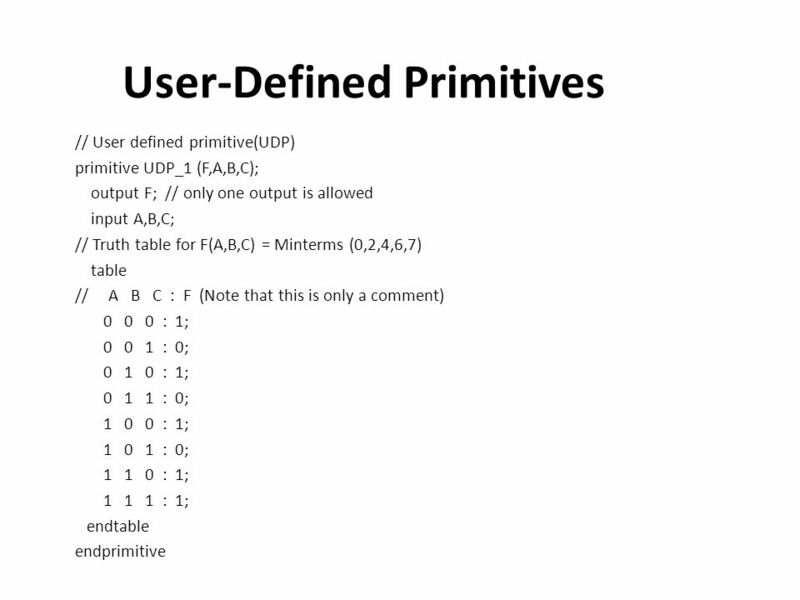 –A high-level computer language can model, represent. The Multicycle Processor II CPSC 321 Andreas Klappenecker. 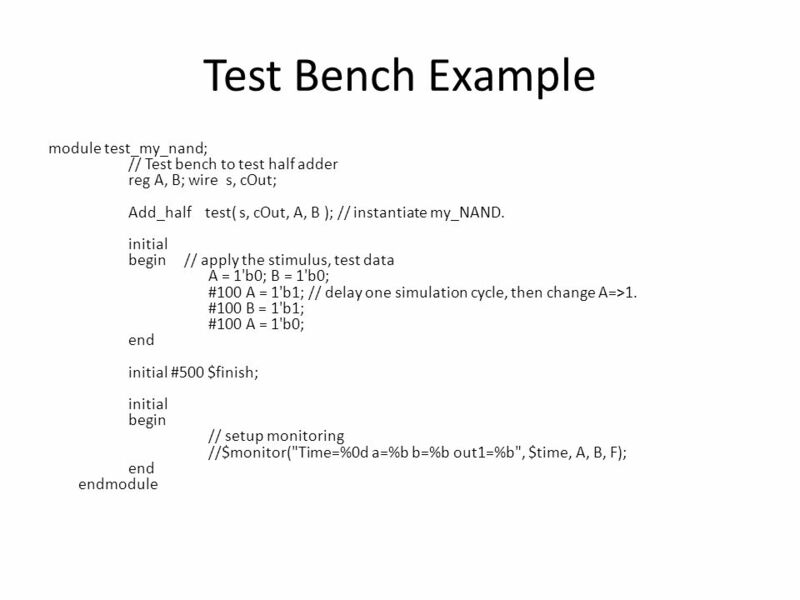 ECE 4680 Computer Architecture Verilog Presentation I. Verilog HDL. ECE 353 Computer Systems Lab I Verilog Hardware Description Language.